The 3rd May is the date set aside annually to celebrate World Press Freedom Day. This date was established by the United Nations General Assembly to raise awareness of the importance of freedom of the press and to remind governments of their duty to respect and uphold the right to freedom of expression enshrined under Article 19 of the Universal Declaration of Human Rights. This year, deep in the African continent, in the fledgling state of Southern Sudan; journalists, media practitioners, government officials, and representatives from international organizations and civil society, gathered in a small hotel room to join the rest of the world in marking this important occassion. The event was organized with the support of Norwegian People’s Aid and the Media Diversity Institute. The event is meant to affirm fundamental principles of media freedom - the ability of the press to voice their opinions and access diverse, independent information sources. Speakers at the event indicated that despite spirited efforts by the media to break traditional information barriers, very little seemed to have been done by the government, and security agents in particular, to help the media in walking this path. They asked the media not to relent in its quest for a truly democratic environment where access to information is not limited. “We have nothing to celebrate about, nothing to boast of, and nothing to take pride in, when our journalists are working under such difficult conditions. Our journalists are arrested daily and media houses are raided daily; papers are confiscated; while we work under constant threats issued by security agents” said Oliver Modi, UJOSS Chairperson. Addressing a pensively listening gathering, Mr Modi challenged the government to state clearly its position with regards to press freedom in Southern Sudan. “We are not waging any war against the government but, we are simply demanding what is rightfully ours. If we gag the media at its nascent stage, I am beginning to sense a lot of danger lying ahead of us. As we come up with the youngest country in the world it must uphold the principles of democracy” he added. Mr Modi further called on the South Sudan Legislative Assembly to speed up passing of the pending media bill to help the media regulate itself. “We prefer to do things the right way but, how do we do this business without any laws in place? What is the motive of delaying the media bill if it means well to all of us?” he asked. 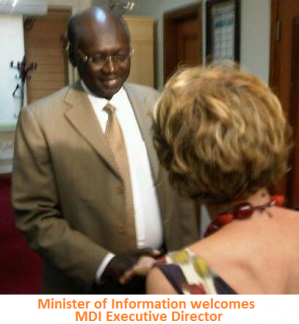 He particularly thanked the Media Diversity Institute (MDI) and Norwegian People’s Aid (NPA) for their relentless efforts in trying to strengthen UJOSS. “Over the past four years, we never had an office as a union; now we have one; we never had any state offices; now we have six operational state offices; we never had an operational leadership structure; today we are here; we never even had any equipment to use as journalists but, today we have given out lots of equipment, including laptops, to individual journalists, thanks to our partner MDI. I really wish we had more of such partners who wish the media well” he said amid ululations from journalists. MDI is currently partnering with UJOSS to produce ‘The People’s Voice’ newspaper supplement, a monthly publication that runs in the Juba Post and Southern Eye newspapers. Amongst the dignitaries who attended the event were Mr Luka Biong, the Director General in the Ministry of Information, Mr Richard Korbandi, Country Director of Norwegian People’s Aid, and Joy Kwaje, the Chairperson of the Human Rights Commission in Southern Sudan, among a host of other organisation’s representatives. In his speech, the NPA representative asked the media to lead from the front in championing for human rights in Southern Sudan. “This is your role and we will support you in every way possible as long as you achieve this course” Korbandi said. On behalf of the GoSS Minister of Information, Mr Biong called on UJOSS and its partners not to relent in their fight to ensure those in authority understand the role of media in a democratic society. He called on UJOSS to keep on pressing and reminding the government of its obligations to its people and he cited the ‘The People’s Voice’ as a true living case of UJOSS’s efforts to help the government understand ordinary people's concerns, though he was guarded in his choice of language and very selective in his use of words. Mr Biong emphasized that while the government had obligations, so too do the media, particularly with regard to ensuring professionalism amongst its membership. He said that the government was not hell bent on harassing the media but, instead felt that the media had failed to live up to its expectations. “We are not against a free media but, we abhor lack of professionalism” he stated.